The FrieslandCampina factory in Aalter produces Joyvalle and Campina milk, Cécémel, Fristi and Nutroma. Since recently, parameters in the packaging department have been monitored on one of the packaging lines, using a tablet running Proceedix. Proceedix is an app that allows businesses to record and monitor their internal procedures in a digital format. All the recorded data are also made easily accessible. FrieslandCampina has been working with PwC and Augnition, which designed the app, on the development programme aimed at improving the suitability of Proceedix for enhancing operational excellence in manufacturing environments. The packaging department at FrieslandCampina runs on three shifts. During each shift a whole range of parameters have to be recorded on the packaging machines, to make sure the line is working correctly. In addition to the fixed list of parameters, at the beginning of each new production run a new parameter list also has to be completed. Until recently these values were entered on paper lists and stored in that form. Using the Proceedix app, paper has become a thing of the past. “There were a number of disadvantages associated with the paper-based process. First of all the shift leader was constantly spending time filing the paper lists. It was also time- consuming to subsequently refer back to the values for a specific machine on a specific day”, says Bianca Defruyt, Head of the Filling Department at FrieslandCampina. The transition to the digital ￼￼￼procedure has been well received by employees of all ages in the packaging department. Ease of use is the main reason for this. An operator logs on, using a QR code or his badge number – which is how FrieslandCampina hopes to operate in the future – and also scans the QR code on the relevant packaging line. He is then guided through the procedure step by step. “At the beginning we emphasised that clear visualisation was very important to us. If values are outside the predefined limits, that should be made clear to the operator immediately using colour codes. When anything is out of range, the operator also immediately receives a message saying that he must inform the shift leader. The paper photo book, which operators can use to look up where exactly on the machine a particular value is displayed, has also been digitalised in the app. As soon as the whole list has been completed, it is transmitted and stored in the cloud”, says Renzo Savat, continuous improvement operator at FrieslandCampina. At the request of FrieslandCampina, a pdf version of the parameter list structure and a graphical job instruction has also been provided. “This means that when the leaders are not present, our operators are able to consult these documents on the tablet if they have questions or if anything is not clear”, explains Renzo Savat. The app administrators can easily add new parameter lists themselves and they can consult the data as soon as the lists have been transmitted. At present this is still done by downloading it to an Excel document, but in a future release the app will include analysis functions, allowing the administrators to view graphs immediately. “That will give us much better insight into what is happening in the department. It will allow us to pick up trends much more quickly and, for example, plan extra preventative maintenance where necessary. This carries considerable potential for further savings in the future. Using the paper procedure we were only able to look for information reactively, after a problem had occurred”, says Bianca Defruyt. The fact that FrieslandCampina is now using Proceedix in its packaging department is the result of a ‘Collaborative Innovation’ project involving consultancy firm PwC, software developer Augnition and FrieslandCampina itself.Collaborative Innovation is about collaboration between industrial and technology companies, in which they work together to find technological solutions to meet the challenges facing so many businesses in practice. “A lot is being said and written about Industry 4.0 and the evolution to digital operations, but often these ideas remain nothing but theoretical concepts. Through Collaborative Innovation we are trying to make digitalisation on the production floor tangible. Using our network we are able to bring industrial and technology partners together, build scale and then coordinate the joint projects”, explains Johan van der Straeten, manager at PwC. 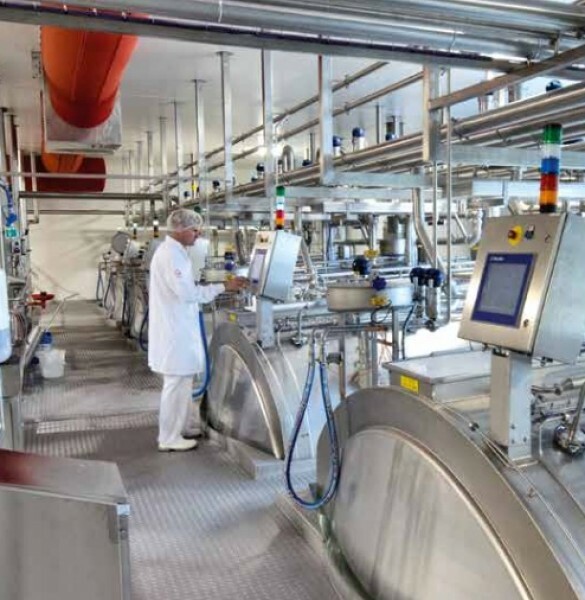 The demo case at FrieslandCampina was the ideal opportunity to fine- tune the functionality offered by Proceedix and optimise it for large- scale implementation. “The app makes procedures accessible in a digital form, wherever and whenever they are needed. That can be done using any kind of wearable device: a smartphone, tablet or even smart glasses. Using beacons or QR codes linked to an individual user account, users can only see the information that is relevant to the task that they are carrying out. There are huge advantages in terms of training, quality and knowledge assurance, standardisation and continuous improvement”, says Peter Verstraeten from Augnition. The official launch of Proceedix is scheduled for November. Users pay a monthly fee for each wearable device.